Each year, WMIA devotes a great deal of time, resources, and volunteer hours toward the interpretive programming at two White Mountain National Forest historic sites - Brickett Place and Russell Colbath. Click on Photos to Learn More! 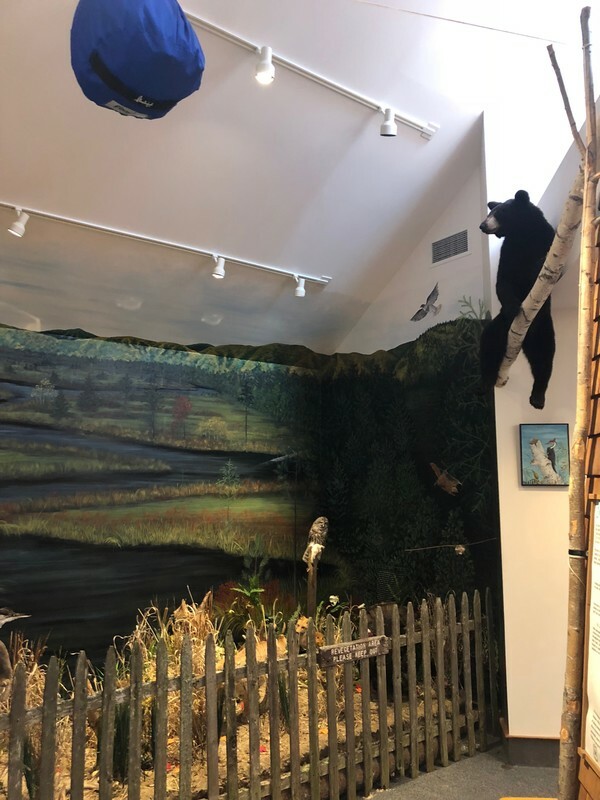 Every year, we are proud to support summer educational programming at various locations in the White Mountain National Forest. Each Saturday evening in July and August, we offer interpretive programs at 4 Forest Service campgrounds. These hour-long programs are free to the public! 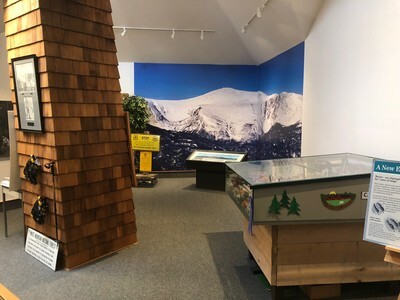 In 2016 White Mountains Interpretive Association spearheaded the development and installation of the Boulder Loop Interpretive Tour at the popular Boulder Loop Trail. The Trailhead Steward Program is a volunteer program partnered with the White Mountain National Forest, designed to equip forest visitors, including dayhikers, backpackers and climbers, with information they need while traveling in the backcountry. The information is intended to help visitors protect the fragile resources of the White Mountain National Forest, keep themselves safe, and prevent costly search and rescue operations. This program focuses on informing visitors BEFORE they hit the trail by a brief interaction at the trailhead. WMIA is proud to lend financial support to this important program. Interpretive panel funded through WMIA and located at Diana's Baths. 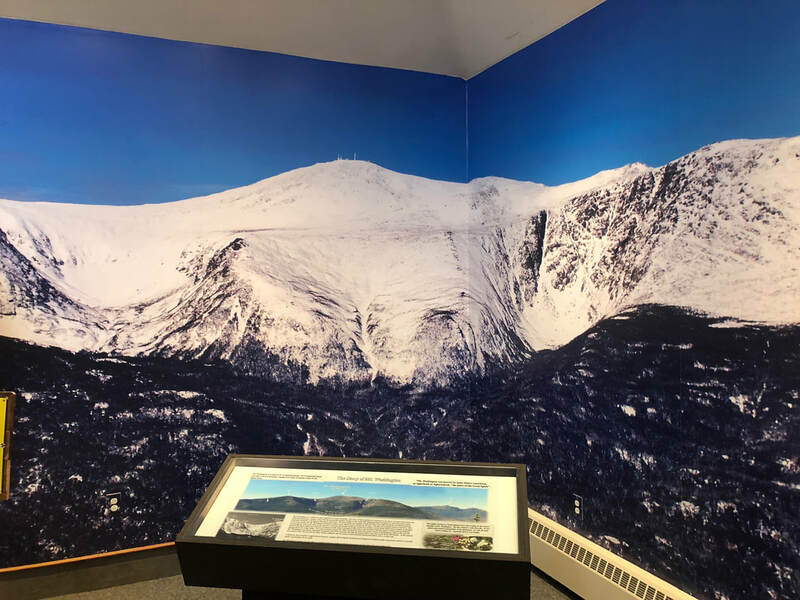 As part of our mission, the WMIA looks for ways to bring information to the visitors to the White Mountain National Forest. In recent years we have funded the production of several permanent interpretive panels for 3 popular sites. Two panels were designed for the very busy Lower Falls area along the Kancamagus Highway. The watershed area and water safety is the topic of one panel conveying to visitors the powerful force of water. The second panel focuses on the history of the site and construction of the site by the Civilian Conservation Corps during the Great Depression. 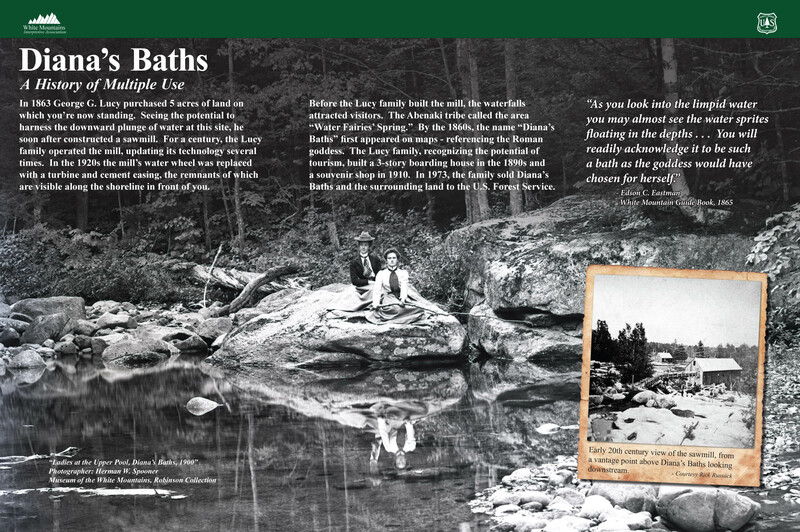 Another panel was designed for Diana’s Bath, providing information on the site’s long history of tourism to North Conway, while visible mill foundations provide clues about the economic past. 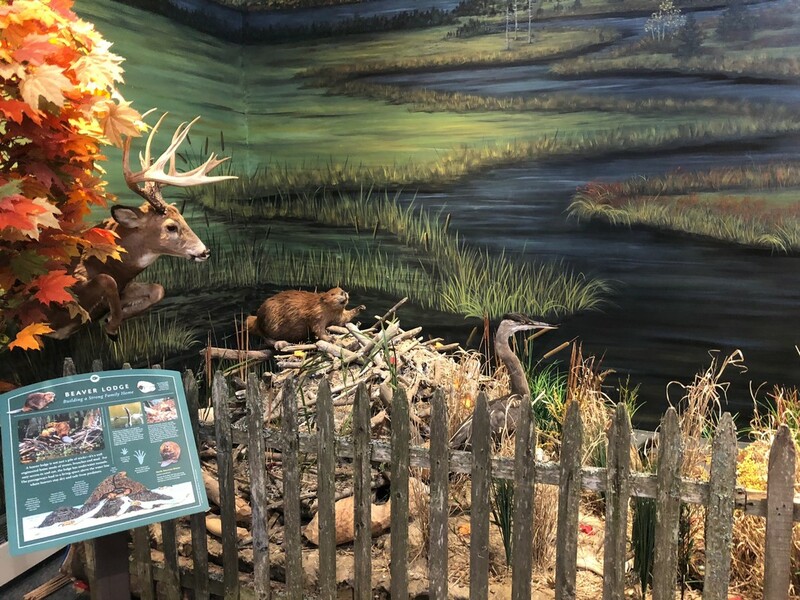 Another display is located at the Androscoggin Ranger Station and tells the story of Mt. Washington through the ages, beginning with its first visitors, its alpine environment, and its role today. 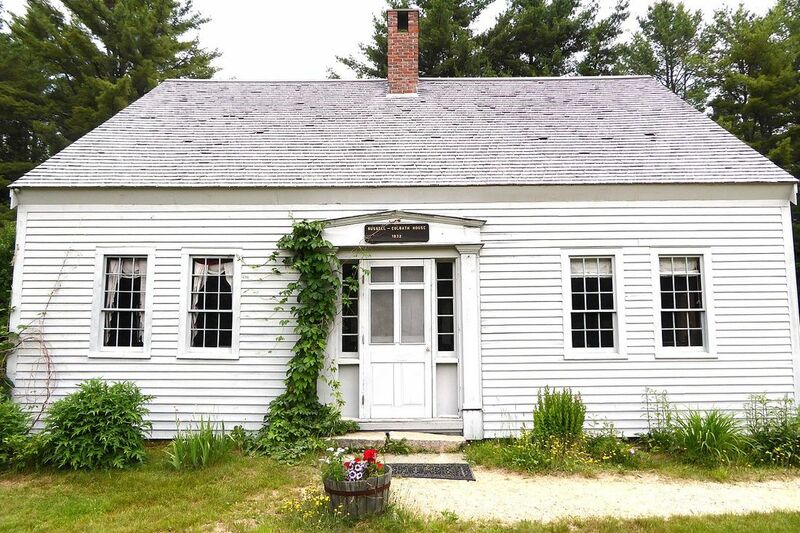 The Barn at the Russell-Colbath House is the location of a new panel funded by a gift from the Passaconaway Valley Civic Association (PVCA). 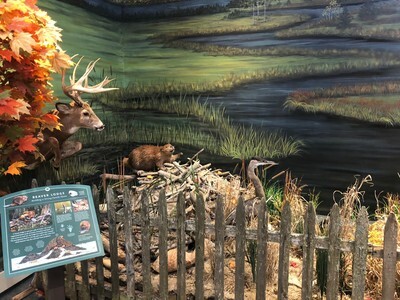 The PVCA, a partner of the WMNF, worked with the Forest Service to help fund the construction of the Barn by the Timber Framers Guild in September of 2003. Today the Barn provides a space for interpretive programs, use by the Forest Service, and is available for special use rental. Many thanks to the members of the PVCA who shared photos and details used in the panel. Funding for the Russell Colbath Barn Interpretive Panel was made by the PVCA in memory of Don West. Mr. West was an employee of the Saco District ranger station for many years. He developed a deep friendship with many of the resident of Passaconaway Valley. White Mountains Interpretive Association considers financial grants each year to support Forest Service conservation education programs. These programs vary from school visits to hosting of school, camp, or civic groups in the national forest. Without this program support, the White Mountain National Forest would be unable to maintain its educational outreach programs. Program supplies for Boys and Girls Clubs. Craft supplies for education programs. Volunteer support to host educational programs. Reprinting of the Weeks Act Legacy Trail brochure. Over the past several years, White Mountains Interpretive Association has worked with White Mountain National Forest interpreters in taking an active role in funding new displays at the Androscoggin Ranger District's visitor center.